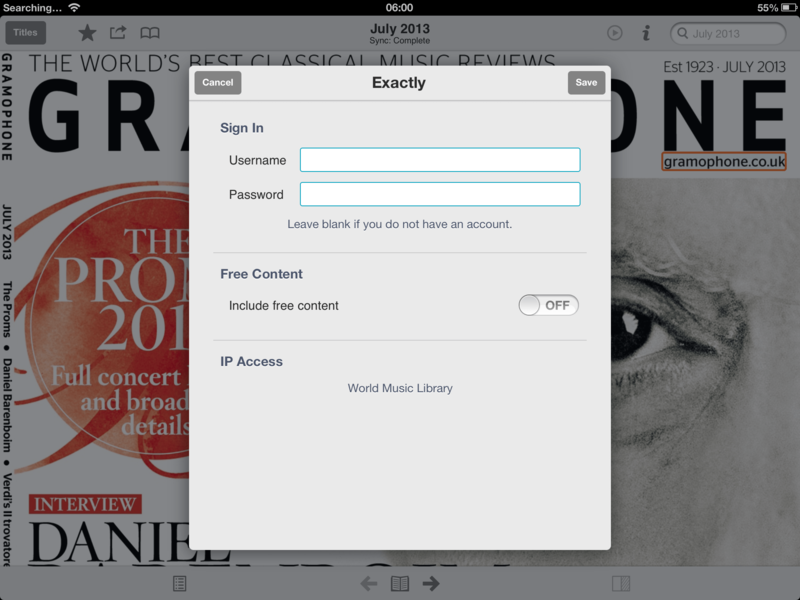 Exact Editions has a generic app, Exactly, for reading magazine subscriptions. The app is available both for iOS, for Android and for Amazon Kindle Fire and it will work with any subscriptions hosted by Exact Editions. Exactly has had several important uses for us and our customers. It is an app that we can use to provide confidential trials to publishers who may be planning to join the Exact Editions platform. It has also been useful for those small circulation magazines that use the Exact Editions platform but for some reason are unwilling to commit to an iOS branded app, their subscribers can then use Exactly on the iPad to get a reading experience which is essentially the same as they would get with a branded app. The Exactly app, also has one hitherto marginal advantage, it is the best choice for a customer who wants to subscribe to several digital magazines and use her collection as a searchable magazine library. Exactly will happily search complete archives for as many magazines as the customer cares to put in the subscription. So for those customers who buy a clutch of magazines from Exact Editions and want to consult them all on the iPad, the Exactly app is a great ‘aggregator’. For libraries and universities this is a big deal. Exact Editions is the only digital magazine platform that specifically caters for institutional subscriptions for consumer magazines, and until now, our institutional subscribers have only been able to access their magazine resources through the web, their readers have had to use the browser interface which Exact Editions has always supported. Great, but not ideal when universities, colleges and schools are rapidly moving to iPads and tablets. There has to be a strong case for providing access to digital magazine subscriptions through the magazine apps. iPads are gaining rapid acceptance in educational institutions (portability, ease of use, beautiful apps, consistent behaviour) and getting magazine apps, reading apps and creativity solutions to work across campus is a major goal for Apple and educational publishers. A final note. The World Music Library does not yet exist. It is a hypothetical IP-based subscription service to a wonderful collection of music magazines (the periodical collection that every music library wants). In our next blog we will investigate why such IP-based network subscriptions to collections of magazines will be a great thing and not just for educational institutions.